Dinner in The Rib Room didn’t start well for Mrs Diner. She wasn’t talking about the huge signs in the hotel car park, which would have out-brashed any Harvester Inn. Nor did she mean the tired, swirly carpets, or the strange combination of castellated manor house and log cabin, with its plain vaulted wooden ceiling and heavy Victorian interior. Nor did she mean the restaurant itself, a cross between Angus Steak House and French brasserie. She was staring at the menu in front of her, mouth agape. She read out: ‘6oz Fillet - Perfect for a lady’. They sure know how to rub up the lady of a food critic the wrong way. Outraged, she laid into them: Haven’t they heard of ‘filet mignon’? 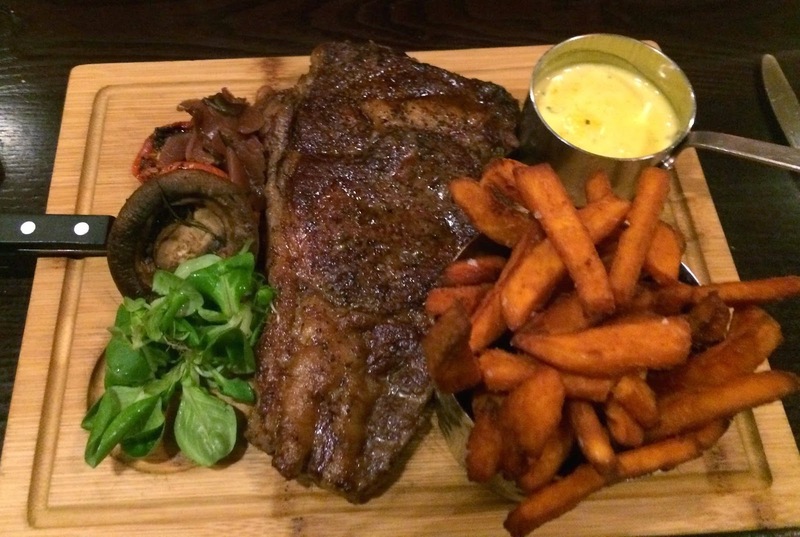 Do they think ladies shouldn’t order the ‘20oz Ribeye – House Special’? I’ll show them! Eventually I calmed her down with a glass of St Emilion. It was Lalande de Gravet – undistinguished, light, probably young (the menu didn’t give us a clue). The wine list was laminated too, photographed on fake crinkly parchment. 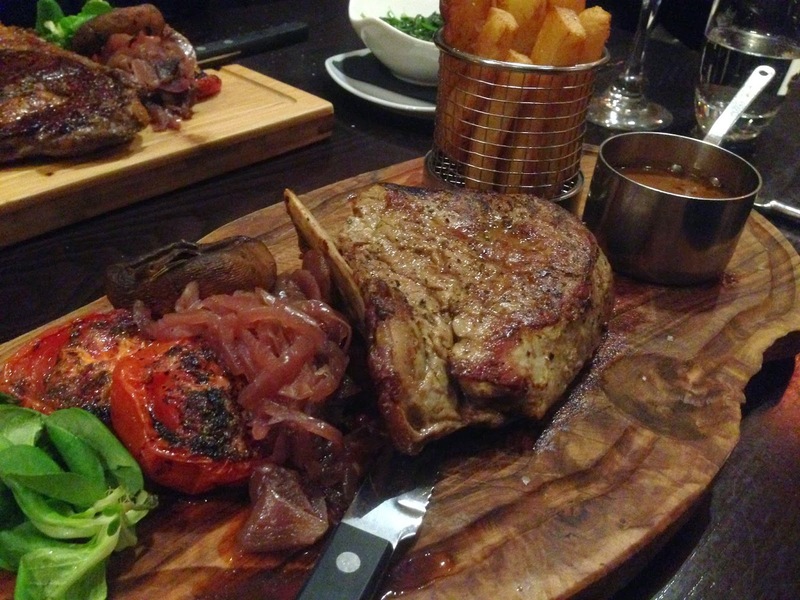 ‘Beaujolais and red meat…probably the best combination in the world,’ it shrieked. Presumably they were trying to be ironic. Beaujolais, barely quaffable even when chilled and surrounded by Gauloises, pairs best with salad. The Rib Room was packed. There were lots of couples, a big noisy golfing party (the hotel has a golf course), and a middle-aged pair who’d dressed as if they were going out to a nightclub, then changed their mind. Towering heels and shiny leather trousers looked strange in this dowdy place. So too did the meat locker. 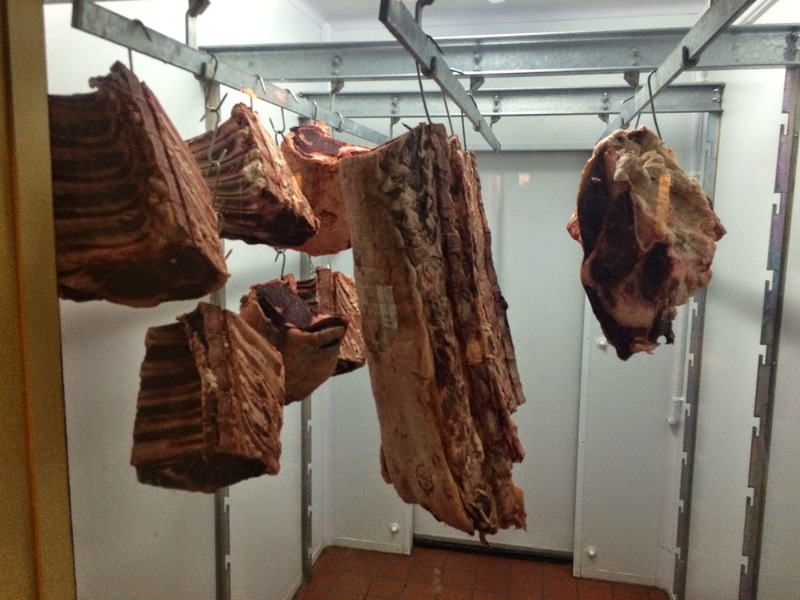 There’s a window in the restaurant where you can watch the meat hanging around, as if suspended in a Damien Hirst installation. It’s not exactly riveting entertainment, a few ribs dangling motionless in mid-air, but it proves this place cares about its meat, which is dry aged for 28 days. The day’s supply, according to the blackboard, was from Frank Dove, a farmer from Bishop Middleham. 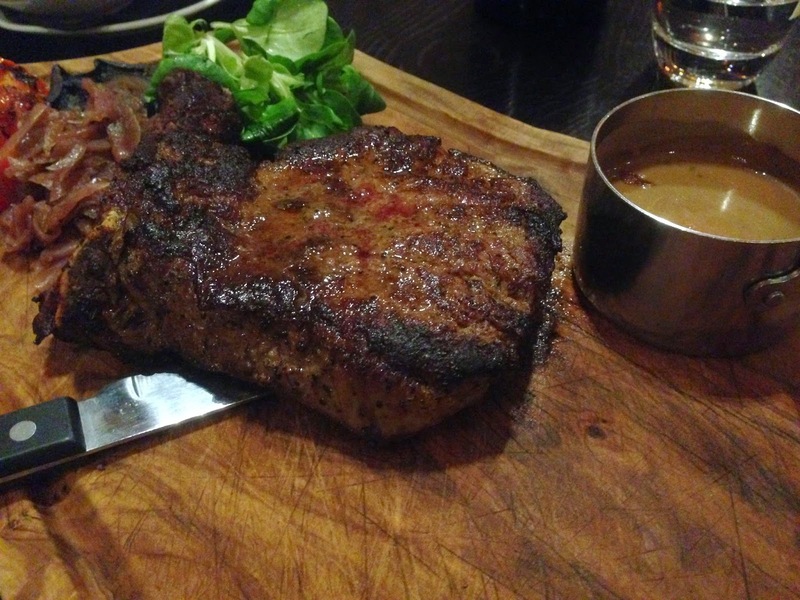 We ordered a lady-sized rib-eye (£19.95) and also a fillet on the bone (£28.50). 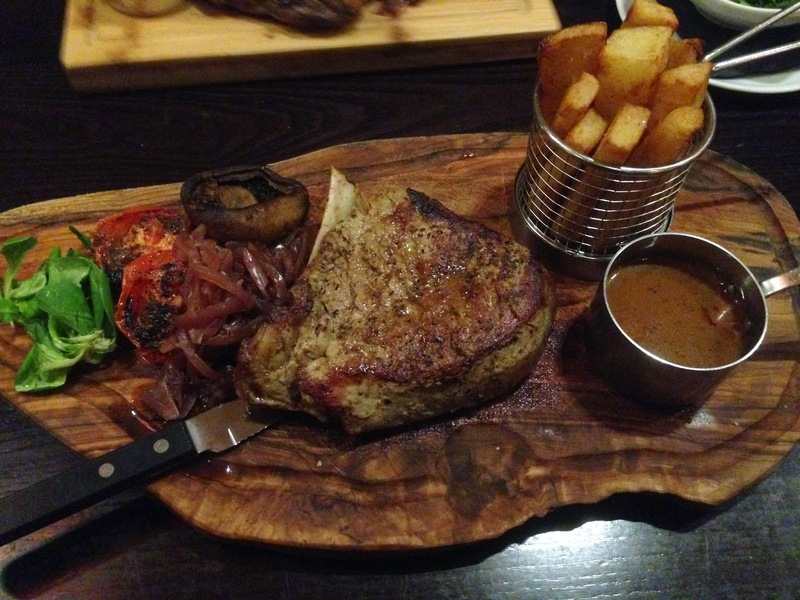 A fillet with a bone - that’s not something you see very often. Except on a T-Bone, I guess. As it happened, the bone was the fillet’s undoing. But first we had cheese soufflé. It would have worked well when Ramside Hall Hotel first opened its doors in 1964. 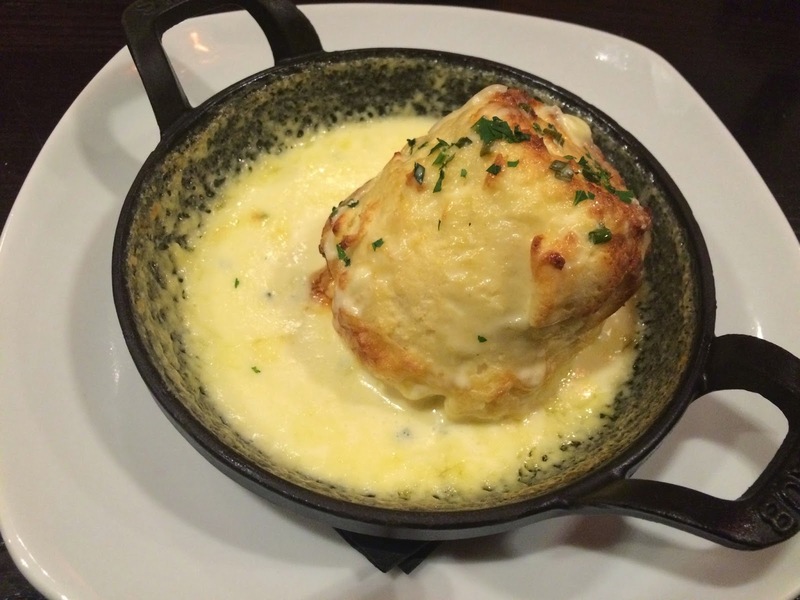 It had mustard in the sauce, the cheese was strong, the soufflé was light, properly risen then presented in its own skillet – sure, it was old-fashioned, but I liked it. 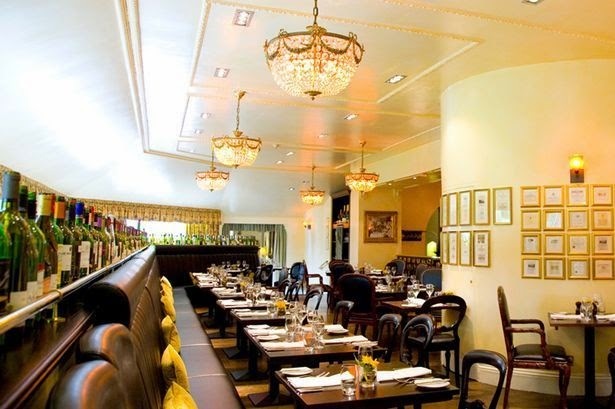 I also found I was warming to the room: there were loads of pictures hung together on one wall, like a Parisian bistro. There were rows of wine bottles. Best of all, there was a maître-d’ from the Loire, called Jean Rouselle. He’s a gem. Anyone wanting a French ambience in the North East should poach this man – he’s utterly authentic, bustling around his young, enthusiastic underlings. He’s got them well trained, and they all make you feel at home. I understood why the place was full of locals. It's like popping over to France for supper. In 1964. 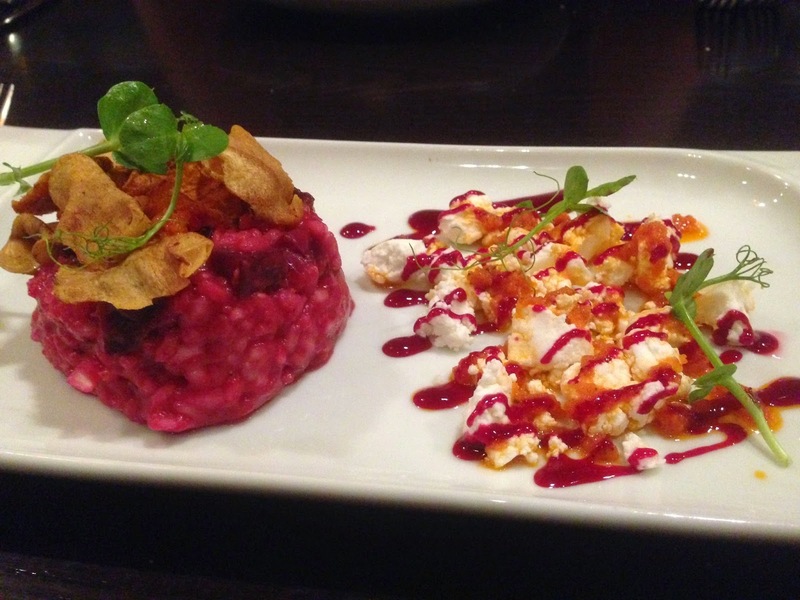 I liked Mrs Diner’s beetroot risotto even more. They’d managed to get a real earthiness and sweetness out of the beet, the rice was spot on, and there were homemade crisps on top, with peashoots. There was crumbled goats cheese on the side with pink and orange gloop, which was less successful, as the orange gloop was vinegary. But generally the starters boded well for the main action: the steaks. They arrived on wooden boards (what else? ), with two halves of too-sharp tomato, an arid mushroom and a sprig of mâche. There was also a spoonful of ‘braised’ onions, which ought to have been caramelised, but which were actually marinated in something rather acidic and nasty. Token presentation rather than proper accompaniment, sadly. There was a choice of sauces - we tried Béarnaise and green peppercorn. Both were acceptable. Then there were the fries. These cost £2.75. Hang on a minute. The fries were extra? Yes, I’m afraid they were. 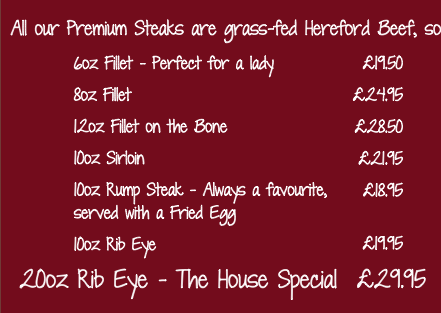 If you believe, like me, that a steak is undressed without fries, you need to add £3 to the prices above. There was a choice of "American fries" or handcut chips. The American fries should have been called French fries (American fries are actually fried potatoes, not chips), but the handcut chips, in a tiny frying basket, were very good, as were the sweet potato fries I added to the mix. 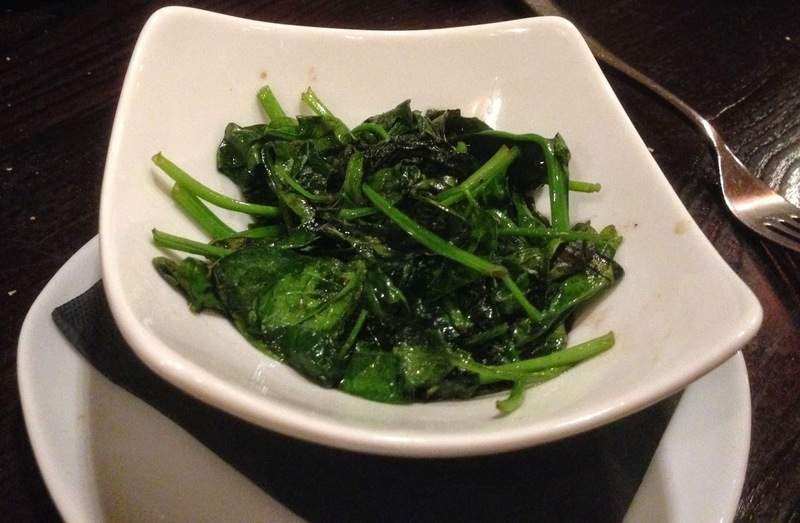 We also ordered spinach, and the smallest portion in the world turned up in a tiny bowl. I hate it when restaurants use overpriced sides to plump up their margins. So 1980s. Nowadays good restaurants let their chefs should decide how to present their main courses, and include accompaniments to fit. Dried up mushroom and acidic onion mush don't cut it. But to get to the meat: this ribeye was delicious. Spot on, perfectly cooked, tender as a 28-day rib could ever expect to be, well seasons, with a nice thick dollop of tasty fat at the point. But the fillet? Oh dear, we ordered medium-rare, and it arrived over-medium, which to anyone means tasteless and dry. It was sent back, of course, but the unflappable M. Rouselle handled it well, and a few minutes later out popped another fillet on the bone. Too few minutes, sadly. This one was blue. Mrs Diner and I looked at each other. Could we dare to send a second fillet steak back? You bet we could. I hoped they had a nice hotel dog. By the time the third steak arrived, the restaurant was emptying and the ribeye was long gone. This one was a little over, but edible, but it hadn’t settled, so it was tough. I reckon it was the bone that did it. Although it’s supposed to make the meat sweeter, it also makes the cooking uneven unless it’s trimmed correctly. This wasn’t. It was a shame, because by now M Rouselle and I had become best buddies, the wine was flowing, and we were there for the long haul. So we ordered dessert. These were even less successful. Chocolate marquise was heavy and cloying. 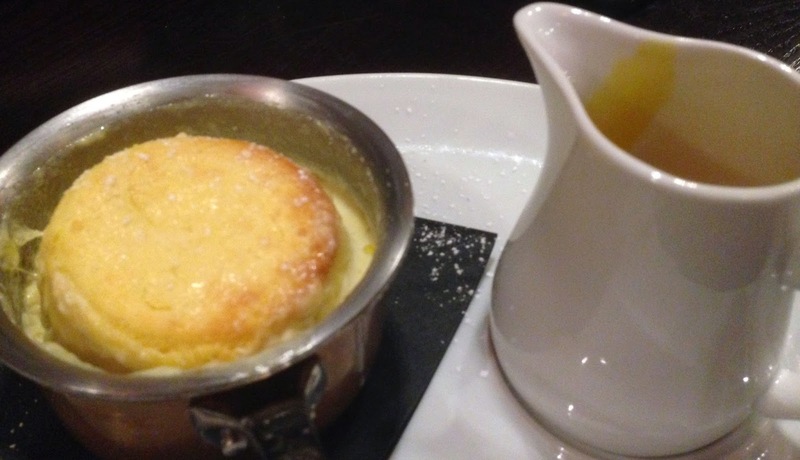 A soufflé was supposed to be passionfruit and mango, but arrived sunken, plain, tasting only of flour, with a passionfruit coulis on the side that needed more icing sugar. The sauce was so sour I winced. Maybe it was the chef’s revenge for the two rejected steaks. If so, he has been rewarded with just two stars. It’s a shame, because I suspect that on a good night, just for the rib-eye, it could have won three. This post is very nice. 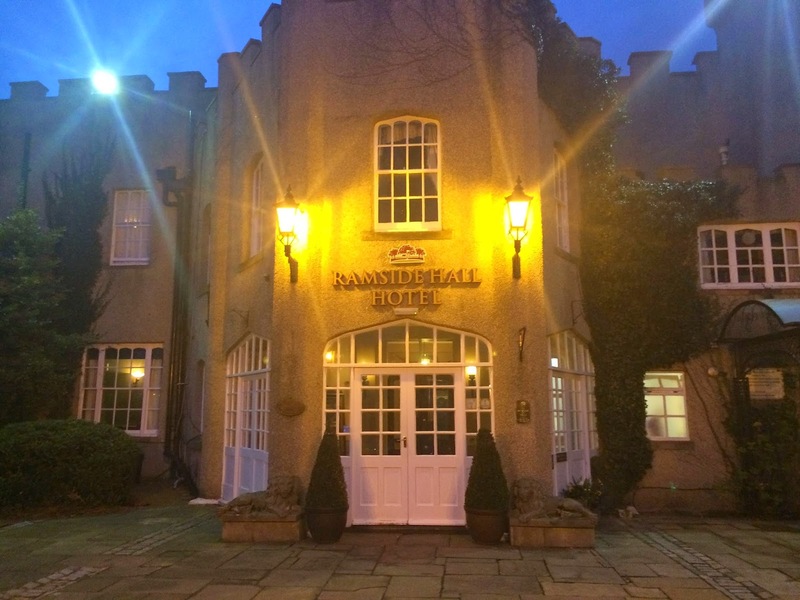 Ramside Hall Hotel is awesome. Foods are very delicious to look at. Thank you for sharing the information. Hope your next recipe will published soon. could not disagree more with this review. this is my favourite place and we eat out at least twice a week. maybe expensive ( with addition of sides, however you are guaranteed a perfect steak. was tremendous bad luck about your experience.